A young picker hard at work. 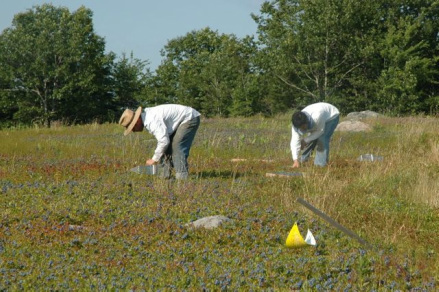 Low-bush blueberries are grown over a two year cycle. In the spring, after pruning half of the field by mowing or straw burning, we weed by hand pulling, clipping and scything. The low-bush plants set flower buds in the fall. These buds (hopefully protected from the winter by deep snow) bloom in May and are pollinated by wild, bumble, and honey bees in May. The field is literally a-buzz! The blueberries begin to ripen by the beginning of August and continue to ripen throughout the month. The ripe berries are then raked by hand with a comb-like tool into field boxes and then run through an electric winnower to be sorted into pints, quarts and freezer boxes. We sell half of our crop fresh directly from the farm, locally at farmer’s markets and grocery stores. We freeze the rest to sell year round and make blueberry jam. The berries are carefully harvested as the clones ripen. They are winnowed, sorted, and packed for fresh markets or frozen within hours.